Northwestern Memorial Hospital Workers Join the “Fight For $15” Movement! 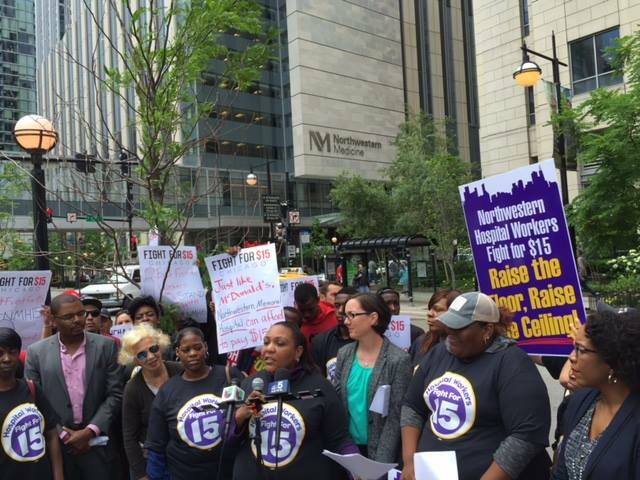 (June 28th, 2016, Chicago) – Northwestern Memorial Hospital workers announced they are joining the “Fight for $15” movement to set a new wage floor for all low-wage healthcare workers at Northwestern Hospital and across the industry. On July 1st, Chicago’s minimum wage will rise another fifty cents to $10.50 an hour. But for Northwestern Memorial Hospital’s front line staff, a substantial number of workers will only make a $1 to $1.50 above the Chicago minimum wage despite the fact that they are critical support staff for Chicago’s flagship hospital. Multiple Chicago TV stations reported the Northwestern Hospital workers kicking off their effort including NBC’s morning and evening broadcasts, CBS, Univision and Telemundo. WGN 720AM radio interview also interviewed Lakeena Whitfield, a Patient Care Technician about why she’s joining the fight to life the wage floor for all hospital workers. Northwestern Memorial Hospital health care workers called on the hospital Tuesday to raise their wages to a minimum of $15 per hour. Smith joined roughly 30 other Service Employees International Union Healthcare Illinois in the “Fight For $15” movement at the demonstration across the street from the downtown hospital. The minimum wage in Chicago expected to rise to $10.50 on Friday. The lowest starting wage at the hospital is $11.50, meaning, several members of SEIU will start working at the hospital for a just dollar over the minimum wage, according to Smith. 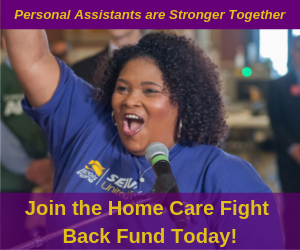 One hundred seventy-five of the 1160 of the SEIU Healthcare Illinois members, which include patient escorts and custodians, make under $15 per hour at Northwestern Memorial, according to the SEIU research team. “I believe anybody should make a livable wage,” said Lakeena Whitfield, a patient care technician at Northwestern Memorial. Whitfield used to make $11.81 per hour as an environmental service worker at the hospital. She said she went back to school to become a patient care technician in order to make her current wage of $18.91. Adriana Alvarez, a McDonald’s Employee and single parent, spoke to the crowd in support, saying it’s unfair that she has to decide whether to put food on the table or pay a bill. Northwestern Memorial’s banking statements reveal that its revenue after the second quarter ending Feb. 29 was $2.1 billion, according those at the rally. Hospital workers along with elected officials, including State Representative Kelly Cassidy (14th District) and Juliana Stratton, the presumptive State Representative for the 5th District, were joined by leaders from the fast-food Fight for $15 campaign called upon Northwestern Memorial Hospital to continue to be an innovator and industry leader by setting a higher wage floor of $15 an hour. Many patients, employees and members of the community are unaware that such a respected hospital such as Northwestern pays such low wages and that many hospital workers are unable to afford the Northwestern’s own health insurance plan. “It is a constant struggle to make ends meet at the end of the month. The work itself is exhausting. I know how hard I work and that I contribute to the success of Northwestern Hospital. I’m simply asking for a fair wage of $15 an hour on behalf of all my fellow hospital and healthcare workers,” said Juraine Johnson who works in Environmental Services. State Representative Christian Mitchell, whose district includes Northwestern Memorial Hospital’s downtown campus, released a letter to the hospital workers represented by SEIU Healthcare Illinois expressing his strong support for healthcare workers earning $15 an hour. Rep. Mitchell urged Northwestern to strengthen its hospital workforce by raising the starting wage floor and to become a true industry leader. Rep. Mitchell wrote: “As the State Representative of the 26th District, it is my responsibility to work on behalf of the many diverse constituencies of my district in Springfield. Among those constituencies are the many hardworking employees of Northwestern Memorial Hospital…I am supportive of the efforts of SEIU Healthcare Illinois to ensure that all of their members earn a living wage of $15 an hour…But it is my firm belief that NMH can be a leader in ensuring their workers are compensated fairly and that such an investment will lead to continued growth for NMH, its healthcare providers and the patients it serves.”(Letter from State Rep. Mithcell to NMH Workers Supporting Fight for $15 ). Right now, Northwestern Hospital has a “two-tiered” wage system where front line and support staff start at about $11.50 an hour. But workers must serve five years until NMH gives them substantial wage increases or to earn a living wage. Northwestern Hospital workers are leading the campaign to raise the starting wage to $15 an hour for all workers within the Northwestern Hospital system—including workers on the Northwestern Hospital campus who make minimum wage and are only getting a raise because of city ordinance – and for healthcare workers throughout the entire region.